Lee Rosenbaum, Culturegrrl, is a shrewd observer of the cultural scene in North America. She is a fan of the Met's former director Philippe de Montebello - who can forget her moody rendering of "Philippe Baby"? (still unavailable on iTunes) - and comments on his new role as Special Advisor to the Leon Levy Foundation. News to me last night was that among the many hats that Professor Philippe now wears is that of consultant ... to the Leon Levy Foundation headed by antiquities collector Shelby White, a major patron of the Met. You can see him in the photo ..., at a meeting convened by the Levy Foundation on "how best to make available the trove of unpublished information from important ancient world sites excavated under "partage" agreements." 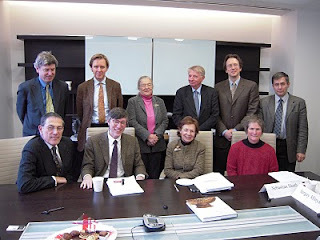 Timothy Potts, erstwhile of the Kimbell, now director of the Fitzwilliam Museum, Cambridge, is in the top row, second from the left. Philippe, bottom row at the left; White, bottom row, third from left. The issue of "partage" is one that has been highlighted in recent years by James Cuno. A full list of those in the picture can be found here. You neglected to mention AIA President Brian Rose is also seated between Ms. White and Mr. De Montebello. I do hope you approve of this outreach effort.